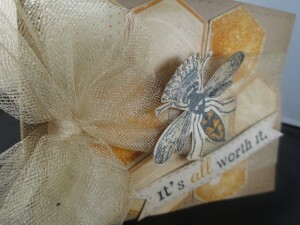 Today is my Unity post ,I have been having a great time creating for this Friday posts .Today I am using the Melody Ross set from Unity called It’s All worth it … and for the background I used a Archiver’s exclusive from Hero Arts Stamp and Cut set called Hexagon . I love this queen bee in the Unity set and thought it paired perfectly with the Hero Arts set I had. 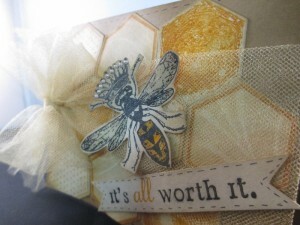 I created the back ground using the hexagon set and Stamping Up More Mustard ink , I then made stitch line around the edge of the card base , I used a gold shimmer tulle ( Hobby Lobby 6″ wide spool ) to tie a bow around the front flap , I then stamped and colored the queen bee and fussy cut her out , I added tiny pearls to her crown ( no queen would be complete without jewels on her crown ..hehe ) and I added glossy accents to her wings , after she dried I popped her up on foam tape at an angle , and then made a sentiment banner free hand after I stamped it out , I used a more mustard marker on the stamp to make the word ALL stand out , I added stitching around the banner to make it pop more .This was a super simple card and I just love how it turned out . 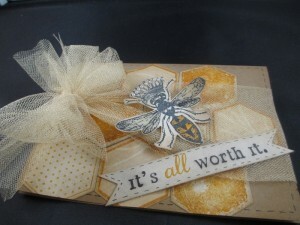 Thanks for stopping by and please leave a commit and your blog name , I would love to come visit you also ..
Fabulous design the hexagons work so well with the Queen Bee! 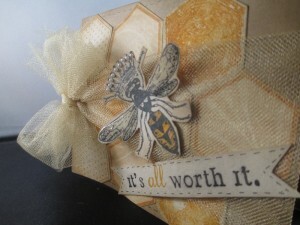 love the hexagons and the colors.. sentiment is perfect with the pop of yellow! Ooh, how fabulous is this? Great job. 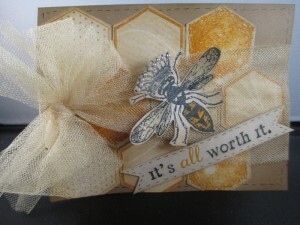 Very creative card with the bee and hexagons! Oh my giddy aunt Crystal…stunning,stunning card,looove it!! Fantastic! Love the queen bee against those hexagons. Your colors are spot on! 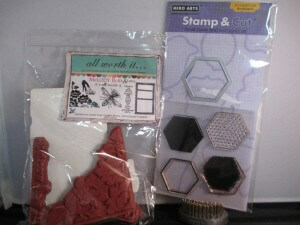 Love how you used the hexagons! Great card! Love this card! Wow, so pretty! This is lovely! The tulle is perfect. Your ribbon is beautiful!! A very cute card ! Great card! What a perfect bow! Congratulations on the Win!! You did an awesome job. Love the Queen bee decked out in pearls.